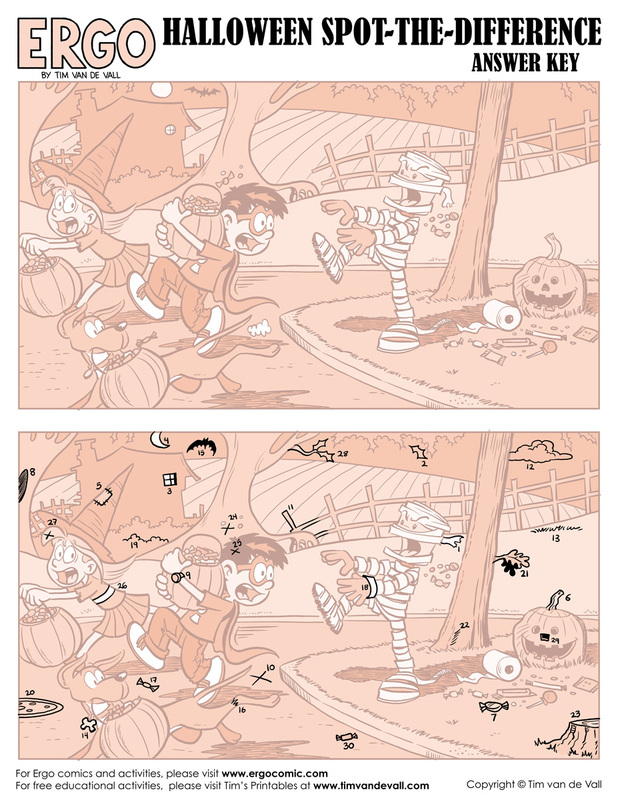 Today’s download is a printable Halloween Spot-the-Difference activity. This one is fun not just for kids, but for grown ups too! I challenge you to find all 30 differences between the two scenes. About a year ago I started drawing a comic strip called Ergo, about a young genius named George, his sister, Tessa, and his robot, Arrowbot. As I wrote and illustrated these characters, I realized I could expand their world by including them not only in my comics, but in my printable activities too. This special Ergo Halloween Spot-the-Difference is one such example. George, Tessa, and McFluff are running to save their Halloween loot from Arrowbot, the candy-crazed mummy. Can you find all 30 differences between the 2 scenes? Please click on the Halloween Spot-the-Difference images to go to the download page in the Printables Library. To see the answer key, please click here. Here’s a 2017 Ergo Halloween comic strip. When science and zombies collide, sparks fly! Are your elementary school kids working hard learning addition? Why not make the activity a bit more fun by downloading this premium Halloween maze worksheet generator. With the click of a button, a new set of math problems with be created, allowing your kids to get all the practice they need. All printables, activities and comics may be downloaded for personal and educational use only. Commercial use is prohibited. Thanks for visiting Tim’s Printables! I hope these activities will help your kids have an extra-spooky Halloween this year.